Built with 7000 series aircraft-grade treated aluminum alloy and stainless steel. Vertically-integrated parts manufacturing to ensure quality control and precision assembly. Heavy-duty installation brackets and rollers crafted in-house to customer specifications. Robust mechanical design requiring zero preventative maintenance. Clutchless ribbon drive and tension control design maximize uptime and long-term performance. Superior Festo® pneumatics assure image quality control & longer printhead life. 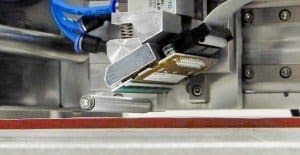 Precision printhead assembly requires lower air pressure to achieve highest print quality. 300dpi Kyocera® printheads on self-leveling mounts provide superior code quality throughout each run. On average, complete FlexPackPRO® systems list for 25-40% lower than competitive TTO systems of comparable quality. Color LCD touchscreen controllers with WYSIWYG print preview come standard with all FlexPackPRO models. Full-featured, highly-intuitive ProCode™ Professional image design software comes free with all systems. Reasonably-priced ribbons, parts and service provide the industry’s lowest total cost of ownership. Many TTO manufacturers charge a thousand dollars or more to upgrade to the complete version of their image design software. Without it, you can’t print bar codes, logos, graphics or a broad range of text fonts and styles. At FlexPackPRO, our full-featured ProCode™ Professional Image Design Software comes standard with every TTO system we sell. 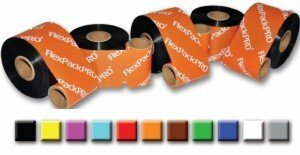 FlexPackPRO’s broad line of thermal transfer ribbon inks and colors provide superior code quality and durability in virtually any flexible packaging or labeling application. 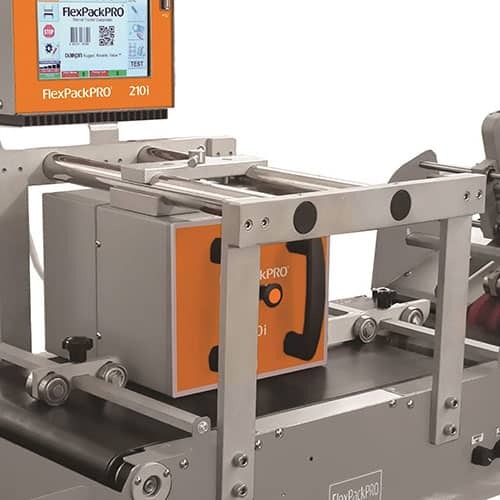 Long-life FlexPackPRO® brand thermal printheads create stunningly clear 300 dpi resolution images at speeds of more than 30 inches per second. Spare printheads and other high-grade FlexPackPRO printer parts are in stock for immediate shipment.